It’s reasonably established that if you provide free versions of paid content, you can benefit financially as fans buy your stuff. The most famous recent example is Joss Whedon’s “Dr. Horrible’s Sing-Along Blog”, which was free for a week or so and can now be purchased. Whedon hardly invented the format. Jim Baen was an early pioneer of this model. In 2001, Baen put online full texts of the SF books he published and hoped that doing so would spur sales – and they did. Other studies support the principle as well. More refined analysis has turned up a relationship, which I’ve graphed to the left. 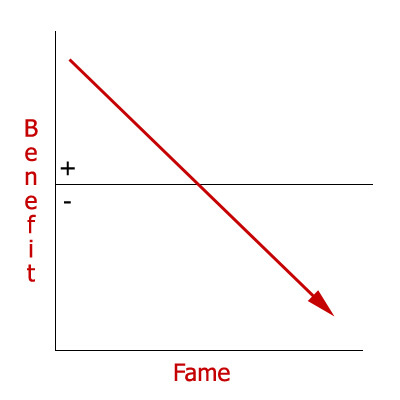 The theory – a term I use instead of “hypothesis” because I think it’s established to be true – is that financial benefit decreases with fame. To put it another way, if I were to release an album, nobody would know about it. Even if I got it out to CD Baby and into the iTunes Music Store, I wouldn’t make too many sales. But if I had a Web site and/or seeded file-sharing networks with the full songs, more people would learn about my product and more people would buy copies. In a sense, it’s like busking. Now, someone like Madonna doesn’t need the same advertising I do, and what advertising she does need she gets from her labels. If she were to release free, full versions of her music, it would hurt her sales. 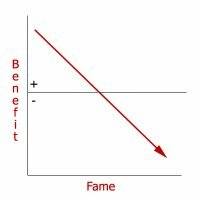 Madonna would not increase her fan base with free product and she’d benefit most from discouraging its dissemination – which explains her infamous P2P files in 2003. That was a longer preamble than I planned, because this post isn’t about texts or music but about DVDs, specifically about TV show DVDs, and even more specifically about Monty Python’s Flying Circus DVDs. The surviving members of that comedy troupe, or whoever controls their rights, have allowed YouTube to display clips of their TV show on their own YouTube channel. Since creating the channel a few months ago, the sales of Monty Python’s Flying Circus DVDs have increased an alleged 23,000%. That’s an astounding number, but even if it’s off by a magnitude or three, it’s still amazing. Fast Company reports that figure as does Mashable, but I can’t find a primary source for that. Some day soon, I plan to buy “Australia” by Science for Girls from the iTunes Music Store. It’s only 99 cents. In the meantime, I can listen to it here. Wired has an extensive article on the future of free product, six pages long and a year old.